Gorgeous butterfly clip-on hairpieces by Look of Love. So easy to use -- just clip on and you're ready to go! Many styles available, from fun and casual to glamorous and elegant. The Butterfly Express Elastic Drawstring can be worn with or without the butterfly clip, or used in conjunction for a more secure attachment! This feature is preferred by dancers for the secure, comfortable fit. 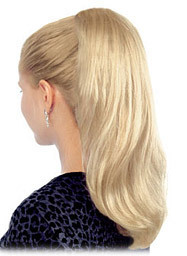 Pull your hair back and put on an exciting new look! 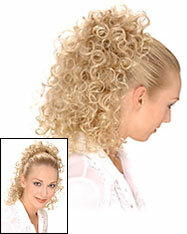 The soft, natural curl is luxurious and can be casual or dressy. You can attach it with the butterfly clip or elastic drawstring, or use both for an even more secure fit. 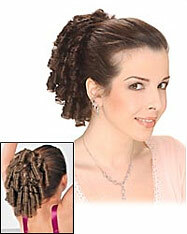 This hairpiece also makes a beautiful braided style! Perfect for dance recitals and cheerleaders! Instantly change your look into a style that would take hours to do with your own hair. Beautiful pencil-sized corkscrew tendrils adorn the crown area, with extra long tendrils all around the perimeter. You can attach it with the butterfly clip or elastic drawstring, or use both for an even more secure fit. 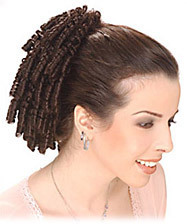 • Overall Length: 11 - 17 in. 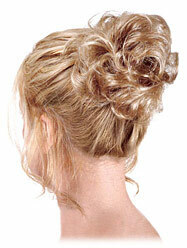 A simple little chignon that clips right on! This small butterfly hairpiece is ideal for those with finer hair of their own who want a petite hair accessory that isn't overpowering. Pre-curled as shown. • Overall Length: 5 in. Putting your hair up in a clip has never been this easy or looked this fabulous! Add luxurious fullness to your own hair with these soft, natural curls. You can attach this piece with the butterfly clip or elastic drawstring, or use both for an even more secure fit. • Overall Length: 9 - 18 in. A beautiful hairpiece featuring curls of perfection. Not too short, with just the right layered hair lengths, this piece comes pre-set with banana curls about the size of a dime. You can attach this piece with the butterfly clip or elastic drawstring, or use both for an even more secure fit.